Designed to aid dive team recovery training, The Ruth Lee GEN2 Dive Rescue/Recovery Manikin has been manufactured with a reinforced, heavy-duty Nylon mesh for the body with non-absorbent closed cell foam for buoyancy. The mesh allows for rapid water drainage out of the body as it is being recovered and also allows for better ventilation when the manikin id hung up to dry. Polypropylene strips, which run from the shoulder area to the knee joint, allow for flexibility whether in or out of the water, but will not allow the manikin to bend in half when using stretchers or recovery devices like the Jacobs Cradle. The addition of a facemask and wig gives the manikin a realistic look and feel and aids with the identification of a human body even in poor visibility. 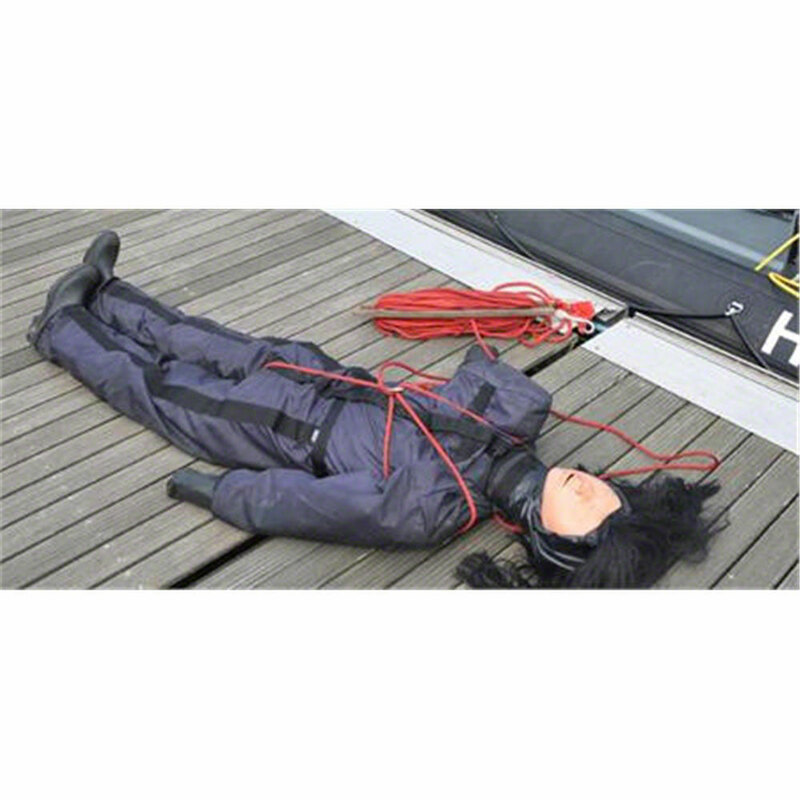 The Adult manikin has a dry weight of 110 lbs (50Kg) out of the water and will sink quickly to the desired position. The closed cell foam adds to the buoyancy, giving a weight of 22 lbs (10Kg) in the water, which is the realistic weight of a body in water. The manikins are supplied complete with Wellington boots and protective coveralls which will greatly protect the manikin and are user-replaceable if they become damaged. One of the unique features of this manikin is that it is Sonar-Compatible. Unlike water filled molded plastic manikins, the Ruth Lee manikin has mass and is capable of being seen on sonar. Manikin is available in Toddler, Youth, and Adult sizes. Select desired size by using the drop-down window above. NOTE: The Dive Rescue/Recovery manikin is for in-water training for Dive Rescue Teams. It is not designed to float. Rather, it is designed to be an analog for a body recovery from depth. For on-water training, use the Man-Overboard manikin. All Ruth Lee Rescue Training Manikins include coveralls. Manikins 44 lbs and up also include lug sole boots. While the strength reinforced coveralls protect the manikin, they are not deemed “Wear-Proof”. Their specific design is to provide a replaceable, washable layer that helps protect the manikin. The coveralls are designed to wear and must be replaced so that the manikin carcass is protected. Use of the manikins should mimic that of dragging a similarly dressed victim. The wear resistance of the coveralls should be considered to be on par with clothing normally worn by the victims. The included coveralls protect the manikin when used during rescue training. The coveralls are not designed to endure the rigors of firefighter drags or physical agility training. The coveralls and boots should be seen as disposable items and should be replaced when showing signs of wear or damage in order to protect the main body of the manikin. Additional clothing is suggested for use in these activities (Even the Combat Challenge dresses their manikins in turnout Gear for this competition). Treat the coveralls as clothing. They are NOT wear-proof. Protect your investment.